Claudia Gryvatz Copquin, introduction by Kenneth T. Jackson. The Neighborhoods of Queens. New Haven, CT: Yale University Press, 2007 (paperback 2009). 259 Pp. Maps, photographs, timeline, bibliography, and index. ISBN: 0300112998. $35.00. The Neighborhoods of Queens offers an astonishing array of surprises in its descriptions of all 56 neighborhoods in Queens. Queens Village, we learn, had long been “an oasis for shooting enthusiasts,” which explains why certain streets there—Springfield and Winchester boulevards, Musket Street, and others—are named for rifles (151); the “moniker” Utopia, given both to the community and the parkway, originated in a land scheme to develop a “cooperative community for Jewish families then living on the Lower East Side” (75); and the “first kerosene refinery in the nation” and “first modern oil refinery” were both enjoyed by Maspeth (139). 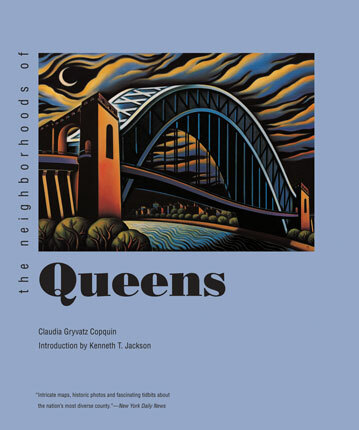 The Neighborhoods of Queens is the third volume in a collaborative project devised by the Citizens Committee for New York City, Kenneth T. Jackson of Columbia University, and Yale University Press. The project seeks to “celebrate the history and spirit of every neighborhood in the city” (xiii), and plans profiles on all of the neighborhoods within each of the city’s five boroughs. The earlier volumes produced by the collaboration include The Encyclopedia of New York City (1995) and The Neighborhoods of Brooklyn (1998). If The Neighborhoods of Queens, in its alphabetical progression from Astoria to Woodside, can be said to engage a central issue, this issue would be the forces that drive development. This is the implicit subject of Jackson’s introduction, and is emphasized by journalist Claudia Gryvatz Copquin in each section of her text. The Long Island Rail Road dominated the nineteenth century, giving rise along its tracks to communities such as Queens Village, Broadway-Flushing and Douglas Manor; the Queensboro Bridge, the IRT and IND subways, in the early twentieth century, fostered the growth of Jackson Heights, Elmhurst, Forest Hills, and others. Following World War II, the driving force became the automobile, which enabled the more prosperous to abandon Queens for new suburbs “out on the island.” This induced serious decline within a number of Queens neighborhoods, particularly Jamaica and Laurelton, but the outward movement of people also opened up many Queens communities, such as Jackson Heights, Flushing and Richmond Hill, for resettlement by new immigrant groups, first African and Caribbean Americans, then, following the Immigration Act of 1965, Asian and South and Latin Americans. Gryvatz Copquin selectively addresses incidents of resistance to this transition, but her larger goal is to celebrate the cultural vibrancy that this mixing of peoples and cultures has produced. Cultural vibrancy, however, has brought increased pressure for development, and Gryvatz Copquin is perhaps overly optimistic in her emphasis on successful efforts by communities to oppose such pressure. She notes that College Point’s “vibrant historical legacy . . . [has survived] in large part because of active, preservation-minded community groups”(24); likewise, “activists” in Jamaica Hills “fearful of losing their neighborhood’s character . . . have worked to [downzone the community] . . . to limit future development” (113); also, in Broadway-Flushing the protective “covenants and restrictions” established in 1909 to regulate development are “still applicable today” (59). This emphasis minimizes the on-going struggle of many neighborhoods against overdevelopment. New York City’s Landmarks Preservation Commission has, for example, repeatedly declined to extend protection to the historic core of College Point; moreover, this past March, the Commission turned down the designation of Broadway-Flushing. Without the protection that historic designation provides, neighborhoods must bear the costs, both legal and emotional, of fighting overdevelopment; how long they can do so remains an open question. That said, we might well hope that the rich profiles presented in The Neighborhoods of Queens will alert more New Yorkers, and those beyond the boroughs, to the pleasures these neighborhoods hold. This knowledge will, perhaps, encourage others to support the efforts to preserve the unique features that Gryvatz Copquin describes.